This is amazing. 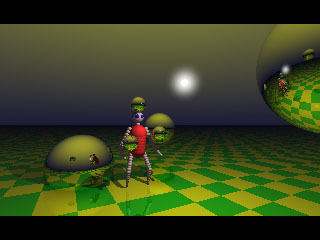 Juggler 2001 is a very cool animation of a guy juggling while being reflected in 3 bouncing mirror balls. The camera flies around the juggler as the sky continually changes color. All this in one executable file that’s only 4,000 bytes. There are multiple versions of this program included in the archive with various rendering styles. The Juggler_Fakemode.com program in the 8bit folder seems to work best with Windows XP. Check it out.